The Justice Department won’t dispute a federal court’s decision that the Affordable Care Act is unconstitutional and should therefore be eliminated in its entirety. This two-sentence announcement represents a position shift from earlier arguments in which the Trump administration advocated striking down only certain of ACA’s consumer protections, such as the requirement that insurers cover pre-existing conditions. A group of Republican governors sued the federal government after Congress eliminated the penalty for not buying health insurance, arguing that the decision renders the entire ACA unconstitutional, a position with which the federal government now agrees. 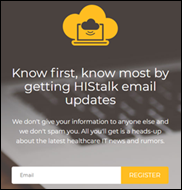 Lorre found and fixed a bunch of new HIStalk email signups (over 1,000, actually) that went automatically and silently into an “unconfirmed” status in the bulk email service I use, requiring manual approval. Welcome if you got your first email today. Sign up here if you aren’t sure since you won’t get duplicate emails even if you’re already on the list. Welcome to new HIStalk Platinum Sponsor Ensocare. 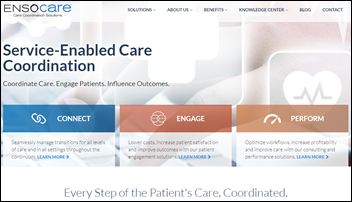 The Omaha-based company’s care coordination solution includes software; a national network of post-acute care providers, services, and community-based organizations backed by 24-hour support; and solutions that help hospitals and payers succeed under value-based care. Transition of care solutions include Transition (hospital discharge software); NEMT (links hospitals to non-emergency medical transport providers); and SDoH (connects patients with community services that can help with social determinants of health). Patient engagement solutions include Wellplan (digital care plans) and Aftercare (RN-led scheduled phone calls). The company’s care coordination platform is integrated with Cerner, Meditech, Epic, and VistA to automate discharges and post-acute referrals. Its Patient Choice app allows patients and families to explore post-acute care options at the bedside. Thanks to Ensocare for supporting HIStalk. 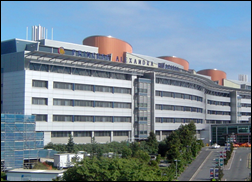 Atlantic General Hospital chooses Welltok-owned Tea Leaves Health for analyzing referral patterns and expanding its physician network. Collective Medical names Jim Lacy (Waystar) as president / COO. Philips acquires Idaho-based teleradiology practice Direct Radiology, whose 70 radiologists provide services to 300 hospitals, imaging centers, and medical practices. UC Davis offers a three-month online educational program titled “Health Information Literacy for Data Analytics Specialization,” which targets technologists with no healthcare experience. Courses include Healthcare Data Literacy, Healthcare Data Models, Healthcare Data Quality and Governance, and Analytical Solutions to Common Healthcare Problems. UC Davis also offers a five-course analytics certificate program for which healthcare experience is recommended, with completion in 15 months or less at at cost of $6,125. Netsmart will implement the 360X interoperability standards for managing referrals and sharing information between PCPs and community-based healthcare providers. 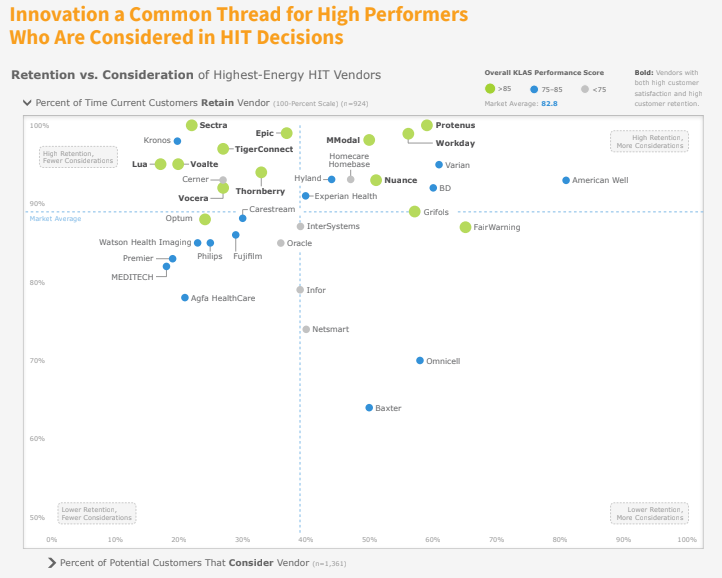 A KLAS review of 2018 health IT purchasing decisions finds that the most active areas were PACS, population health management, ERP, and secure communications. Markets are mature for EHR/PM, automated dispensing cabinets, cardiology systems, ERP, home health, PACS, patient accounting, and smart pumps. Newer and more disruptive areas are behavioral health, patient privacy monitoring, population health management, secure communications, virtual care platforms, and vendor-neutral archive. Vendors ranked at the top of KLAS’s assessment of customer satisfaction and retention are American Well (leads by far), FairWarning, Varian, BD, Protenus, Omnicell, Grifols, Workday, Nuance, and Baxter. 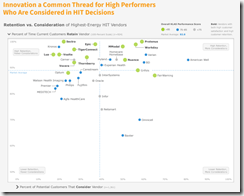 Top reasons for replacing systems are integration, consolidation, and functionality, with price falling outside the top five. Outgoing FDA Commissioner Scott Gottlieb clarifies interview comments that some sites interpreted as his call for more EHR regulation. Duke University will pay $112.5 million to settle federal False Claims Act charges that one of its researchers falsified pulmonary research data to win $200 million in federal research grants. Duke fired heavily grant-funded biologist Erin Potts-Kant in 2013 for embezzlement, after which she pleaded guilty to forgery and Duke retracted several of her papers. The former Duke lab analyst turned whistleblower, 34-year-old Joseph Thomas (above), will be paid $33.75 million of the settlement, while the remainder is set aside to repay the grant money involved. 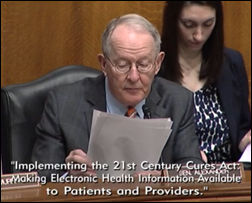 HELP committee chairman Lamar Alexander (R-TN) says HHS’s proposed interoperability rules will provide a definition of information blocking, require insurers to give patients copies of their data, mandate that EHRs support API access, and require hospitals to send ADT notifications to a patient’s doctors. He quotes a Tennessee family doctor who sends printed copies of an admitted patient’s record from his EHR to the hospital for re-keying because it would cost his practice $317,000 per year to send information electronically (he didn’t say who would get that money). Fast Company looks at healthcare’s “giant patient-matching mess,” which it mostly blames on (a) EHR vendors not using a standard format for entering patient information; (b) provider consolidation that dumps the patient records of other facilities into a single database; and (c) lack of an easy way to de-duplicate records of common names that sometimes also share a birthdate. It notes CHIME’s 2015 $1 million National Patient ID Challenge that it eventually abandoned because the problem is too complex, a conclusion reached by Pew, which could only recommend that EHR vendors force standardization of addresses using US Postal Service records. It notes that other countries think the US is fighting an impossible battle to figure out which is the right Maria Garcia or John Smith given Congress’s ban on a national health ID. In Australia, investigative reports show that Queensland Health was so desperate to prove the financial viability of its Cerner-powered IEMR that it planned to go live at Princess Alexandra Hospital in mid-2015 even though the project was in “cannot meet objectives” status. The plan was halted only when a Cerner VP and the project’s delivery director said a six-month, big-bang implementation was not possible, especially in radiology and pathology. 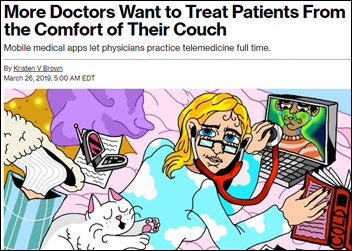 Bloomberg notes the increasing number of doctors who choose a telemedicine practice now that reimbursement has been sorted out and startups such as Hims and Roman need doctors to generate their lifestyle prescriptions. A startup that was founded strictly to place doctors in telehealth jobs says about 25 percent practice full time, with most of the remainder being those fresh out of school or easing into retirement. Doctors still need to be licensed individually by each state — the doctor who is the subject of the Bloomberg article spent $10,000 to gain licenses in 26 states. Stat reports that digital health startups are struggling with how to respond to users who express suicidal thoughts using their mostly unattended platforms. Patients are threatening self-harm during video visits and people are posting suicidal comments to the Facebook pages of hospitals and practices or even to their patient portals. Researchers retest the DNA of 49 people whose consumer genetics tests told them they are at risk, with commercial labs failing to reach the same conclusion in 40 percent of them. Some of the “increased risk” classifications were also incorrect, as the observed variants are common and benign. The authors conclude that consumer DNA testing results should be confirmed by clinical labs that understand the variants better. First Databank’s Meducation patient instructions creation system is added to Epic’s App Orchard. Aprima, an EMDs company, announces integration with RavePoint. Avaya introduces a cloud transformation program, making it easier for companies to adopt the cloud communications infrastructure that best meets their needs. The Digital Healthcare Podcast features Collective Medical CMO Benjamin Zaniello, MD. CoverMyMeds will exhibit at the Technology Health Experience Conference March 28-30 in St. Louis. DocuTap will exhibit at the Pediatric Urgent Care Conference April 3-5 in Dallas.